Pediatric Sports Medicine deals with injuries and illnesses arising subsequently sporting activity and exercise in children and adolescents, using in the treatment the special training and experience in such issues. Pediatric sports medicine specialists operate in different health facilities: large urban hospitals, children's hospitals, private clinics, sports medicine clinics, universities, medical centers, orthopedic clinics. Pediatric sports medicine specialists are trained and equipped to examine, diagnose, and treat injuries and illnesses in active children and teens. 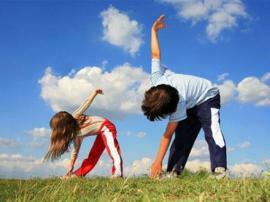 Remember - only your a joint participation and support is needed, to the children took pleasure in sport and succeed. Unreasonable demands and expectations of adults often is the reason that child leaves the sport. The reaction of the child to such pressure can take many forms - it can be a headache, and gastrointestinal disorders, and muscle pains are not the appropriate volume of exercise. Correctly identify these violations can only qualified sports doctor, who in today's childhood and adolescence sport must work with the coach and the parents of the young athlete.